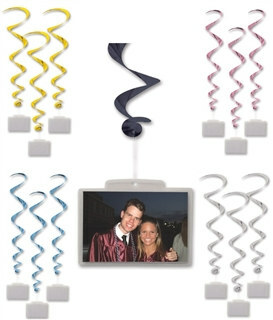 Show off the pictures of the graduate with these Whirls with Clear Plastic Pocket as decoration at your graduation party! The metallic whirls come in assorted colors that you can choose from to match your party theme or school colors! These picture whirls would also be a great way to display pictures at a brithday party or a family reunion. These pictures could even hang over head at a wedding reception to show pictures of the bride and groom!